Yesterday, I decided last-minute to check out the first ever Play NYC convention in New York. While most games were for PC or console, I did find some mobile games and their developers, as well as some games that could potentially come to mobile in the future. I’m not going to talk about everything I saw, but I did want to discuss some highlights. 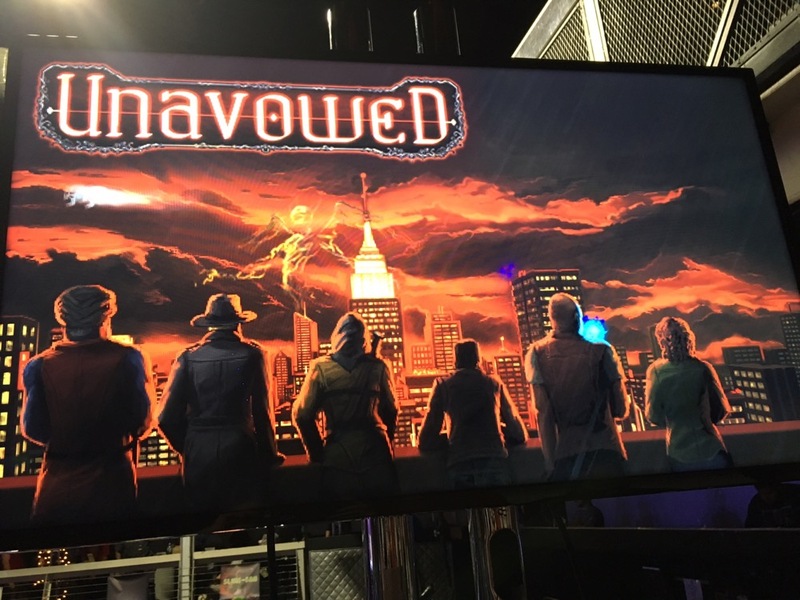 First off, I got to play the demo of Wadjet Eye’s upcoming point-and-click adventure, Unavowed and chatted a bit with developer Dave Gilbert. I really like what I’ve seen so far of the game. Right away I was struck by something that’s uncommon for third-person point-and-click adventures — you can choose your gender and name. You also get to choose between three professions, and I only had my suspicions that each one would lead to a different game until I saw someone else playing a scene I never saw in my playthrough. According to Dave, this early scene is not the only thing that will be different in the full version. There will be dialogue throughout the game that changes based on the career you chose. And there will be secondary characters to choose from with different abilities that will affect how you solve certain puzzles. As a whole, the game sounds innovative and very different from your usual point-and-click fare. And on top of all that, it’s got a great theme full of demons and magic and inter-dimensional portals. There were even some literal jaw-dropping moments that took me by surprise. These conventions aren’t the most comfortable way to play games, as I was standing the whole time with people trying to pass by, but I still thoroughly enjoyed my time with the game and wish I could play the rest of it right now. Unfortunately, that’s not possible but they hope to release it early 2018 on PC. No word on mobile yet, but if we do get it, Dave explained that there’s a lot of work involved in porting it over, so don’t expect it around the same time. Either way, I’ll be keeping a close eye on this one and hopefully playing it sooner than later! Linelight is one of my favorite games from this year and it got a very prominent spot at the convention and a nice big screen to play the game on. Since the developer had mentioned making some changes to bring the game over to mobile, I wanted to see how it felt on other platforms. So after watching others delightedly discover the game for the first time, I played through the demo with a controller. I still prefer the mobile version, but it felt great with a controller, too. And I got to play a unique puzzle that sadly wasn’t on mobile because it couldn’t fit the screen well. I also chatted a bit with the developer, Brett Tailor. He told me that the game sold more copies on mobile than PC, but a surprisingly low percentage of players actually complete the game compared to other platforms. I couldn’t put the game down once I started it, so I’m not sure why others aren’t finishing. But if you’re reading this, don’t be one of those people! It’s such a great game that deserves to be played to the end. Brett also told me that he expects to release the first content update with World A in a couple of weeks, with World B sometime after that. He’s still not sure if he plans to charge for the extra content, but says it’s unlikely. Either way, I can’t wait to play more Linelight! I also spoke to the fine folks at Simple Machine, the minds behind the ingenious puzzler, Calculator: The Game. They couldn’t share any details of the latest game they’re working on, but they are planning more content for Calculator. They also showed off a prototype for a throw pillow of Clicky, the adorable AI that lives in the calculator. If you’re interested in something like that, let them know! I could definitely see cuddling up to that. Or at least fighting my cat for rights to it. Mokuni’s Kitty in the Box has already been out for a few years, but I somehow missed it. It’s got an adorable theme with a very simple premise. 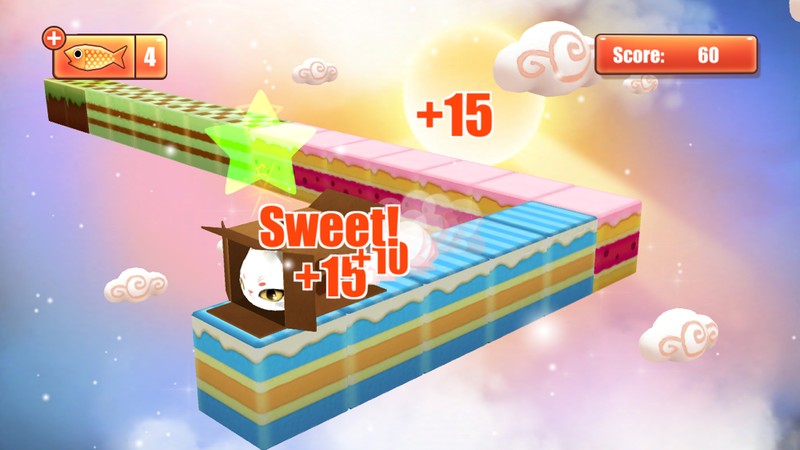 You simply tap and hold the screen to make the kitty run and slide into the box. If you timed everything right, the cat should get to the treat and not slide off the platform. There’s also a more complicated move where you have to swipe up at the right time to jump inside a box that’s facing upward. It’s an endless high score chaser, so you just keep going until you mess up. I thought it was a cute and simple concept that works well and was happy to learn after playing it at the booth that I could download it on my phone right there and then. My only real complaint is that you can watch ads to continue your game. I like my high score chasers to be pure. But still, I recommend checking it out if you like cats. Since I played Sam Barlow’s mind-bending full motion video game (FMV), Her Story, I’ve been keeping an eye out for other FMV games that do interesting things. So Otis caught my eye yesterday. I played through the demo, which you can play yourself on their website if you have a PC. Unfortunately, the site doesn’t load on mobile. I also don’t know if the game will ever be released on mobile. But I really like the concept. You’re basically watching events play out on three different cameras. The only control you have is switching between the three different camera perspectives by pressing the A, S or D keys. It does mean you’ll miss some things happening in the other cameras, and I’m not sure how much of a game it is. But there was something compelling about switching quickly back and forth between the different cameras to see what you might be missing. Almost like channel surfing with purpose. The first episode involves a break-in and follows three different characters. It’s only a few minutes long, so you can play it a few times to see what you’ve missed, though I only played it the once. They’re planning a full series like this for release in 2018, so I’ll be keeping an eye out for it. Since controls are minimal, I’d likely be willing to play it on platforms besides my iOS devices, so I won’t be too crushed if it doesn’t make it to mobile. And last, I got to play the game designed by Jenny Jiao Hsia and AP Thompson, the folks behind the trippy match-three game, Beglitched. They turned a small area of the venue into a child’s bedroom to match the game, which is about helping Bredna clean up her room one item at a time. The game reminded me a lot of the recently-released Silly Walks, where you basically have to learn to walk again by putting one foot in front of the other. The main difference here is that instead of tapping the screen, you have a stuffed animal as the controller. You squeeze the left hand to use the left foot and right hand to use the right foot. On top of that, you have a timer and can only pick up one item at a time. So if the game tells you to pick up pizza and you pick up a toy instead, you then have to put the toy in its rightful place before you can pick up the pizza. It’s a lot harder than it sounds and I failed pretty miserably at it. But I still had fun trying and I love seeing people experimenting with new ways to play games. And those were the highlights for me of the first Play NYC convention. It’s continuing today, so if you’re a local and want to check out some of these games, it’s not too late to do so! And I’ll make sure to keep you updated on any news about the upcoming games that caught my attention.